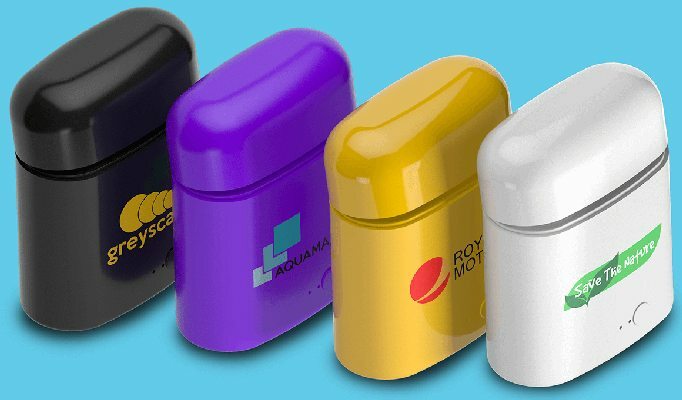 Promotional Bluetooth Ear Pods promotional items. 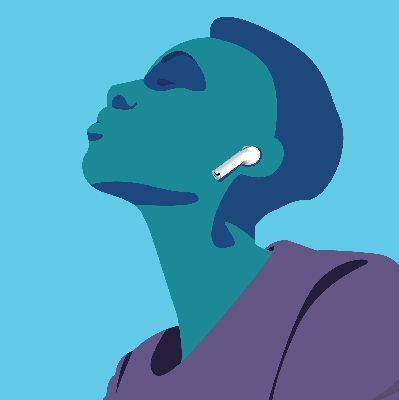 Guide: bulk buy bluetooth earbuds prices. Price includes a UV colour print or pad printed company logo. Delivery £35.00 (or £20 for quantities of 50 or fewer), VAT extra. 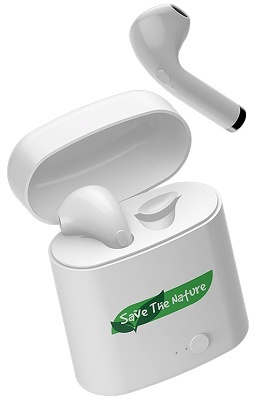 These ear pods in a promotional logo printed charging case provide True Wireless Stereo technology with by using Bluetooth 4.2. The case provides magnetic induction charging from its own 500mAh battery which in turn is charged via a USB cable. The Bluetooth 4.2 version guarantees a coverage of 10 metres. The ear buds have 50mAh batteries and a listening range of approximately 2 hours. Thanks to the built-in microphone, you can also make calls without needing any cables. The case can be customised on both sides with silk-screen printed company logo. Ear pod battery capacity: 50mAh for 2 hours use.